The clothing worn by the Ancient Egyptians was simple consisting of white shifts for the women and kilts for the men. The clothing was adorned by fabulous jewelry, sashes and aprons and by the addition of decorative and highly fashionable wigs. Ancient Egyptian men generally kept the hair short or shaved it off, wealthy Egyptian men then wore wigs. The women of Ancient Egypt kept their own hair long which they plaited and curled. The wealthy women also wore elaborate wigs. The women of early Ancient Egypt of the Middle Kingdom kept their hair short whereas the women of the later New Kingdom kept their hair long, which they plaited and curled. The wealthy women also wore elaborate wigs. Long hair was dressed as plaits or braided pony tails, and occasionally a fringe was cut. The hair of wealthy was elaborately curled and occasionally adorned with jewelry, gold strands, flowers, beads, ribbons and hair bands. The women had a preference for unique hairstyle which were kept in placed with clasps and hairpins. The hairstyles of the men in Ancient Egypt changed little during the whole of the period which lasted over three thousand years. 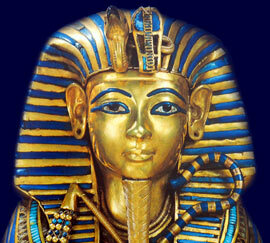 Ancient Egyptian men generally kept the hair short or shaved it off. The wealthy Egyptian men then wore highly elaborate wigs or hair extensions. The Egyptian hairstyles of children consisted of a shaved head except for one, long plaited lock which hung at the side. This lock of hair was referred to as the 'Lock of Youth'. This hairstyle was the traditional style worn by both boys and girls until the age of puberty. At the age of puberty the 'Lock of Youth' was cut off and the young men then adopted the same hairstyle as the men - short or shaved. The young girls then kept their hair long, which they dressed as plaits or braided pony tails, and occasionally a fringe was cut. Their hair was elaborately curled and occasionally adorned with jewelry, beads and hair bands. The fashions and traditions relating to facial and body hair changed during the different periods. Men of the earliest periods, up to the Old and early Middle Kingdom were known to wear full beards and moustaches. This fashion changed during the Later Periods of Egyptian history and men of all roles and status adopted the clean shaven style. Despite the change of style and the new low esteem afforded to facial hair the beard was still considered to be sacred to the gods and therefore the Pharaohs. The beard was considered to be a divine symbol of the gods. Depictions of Pharaohs, both the Kings and some Queens, are seen wearing false plaited beards. These false beards were religious symbols of the Pharaohs emphasizing their status as a living god. The bizarre false beards were tightly knotted and plaited and hooked behind the ears. The styles and shapes of the beards varied from the long rectangular shape which was cut level at the bottom to a long, narrow beard plaited like a pigtail with the end jutting forward, such as the beard from the chin on the mask of King Tut, Tutankhamen. They were worn on important religious and other ceremonial occasions.